The most famous original manga/anime stars are ready to fight! Celebrating the 45th anniversary of the 'Shonen JUMP' magazine and the 20th anniversary of the 'V JUMP' magazine in Japan, a never before seen fighting game has been developed! 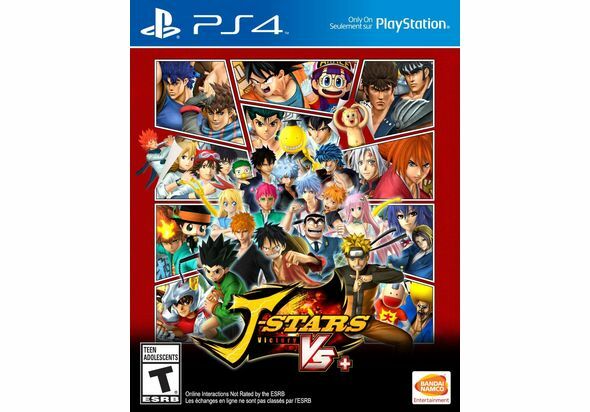 For every Manga and Anime fan, J-STARS Victory Vs+ is jam packed with long hours of intense and amazing battles and a must-have addition to their videogame collection. A teenager who dreams of becoming Hokage of the Hidden Leaf Village. He harbors a spirit known as the Nine-Tails inside him. Formerly a troublemaker, experience has honed his strength and spirit. Naruto's rival and best friend, and descendant of the Uchiha clan. Versed in the ancient art of Sharingan. Driven by lust for revenge against his brother, he leaves the Hidden Leaf Village. A born adventurer who'd do anything for his friends. His dream is to find the legendary One Piece and become King of the Pirates. His body gained elastic properties after eating a Devil Fruit. 2nd division commander of the Whitebeard Pirates, and Luffy's older brother. Son of Gol D. Roger, the original Pirate King. After eating a Flame-Flame fruit, he became capable of manipulating fire. The most famous original manga/anime stars are ready to fight! Celebrating the 45th anniversary of the 'Shonen JUMP' magazine and the 20th anniversary of the 'V JUMP' magazine in Japan, a never before seen fighting game has been developed! J-STARS Victory Vs+ invites fans and gamers to play with their favorite manga/anime characters and progress in the JUMP World through different environments recalling Naruto, Dragon Ball Z, One Piece and other memorable moments. For every Manga and Anime fan, J-STARS Victory Vs+ is jam packed with long hours of intense and amazing battles and a must-have addition to their videogame collection. Naruto A teenager who dreams of becoming Hokage of the Hidden Leaf Village. He harbors a spirit known as the Nine-Tails inside him. Formerly a troublemaker, experience has honed his strength and spirit. Sasuke Naruto's rival and best friend, and descendant of the Uchiha clan. Versed in the ancient art of Sharingan. Driven by lust for revenge against his brother, he leaves the Hidden Leaf Village. Luffy A born adventurer who'd do anything for his friends. His dream is to find the legendary One Piece and become King of the Pirates. His body gained elastic properties after eating a Devil Fruit. Ace 2nd division commander of the Whitebeard Pirates, and Luffy's older brother. Son of Gol D. Roger, the original Pirate King. After eating a Flame-Flame fruit, he became capable of manipulating fire. 1st Time Outside Japan A unique game combining licenses in the famous JUMP magazines is releasing for the first time outside of Japan! Incredible Roster A huge choice of characters coming from the most famous mangas/animes issued in the JUMP Magazine. JUMP World The world where the adventure takes place offers 4 different scenarios in which players can travel in memorable places like 'Alabasta', 'Hidden Leaf Village' and 'Planet Namek'. Epic Battles With the 2 vs. 2 team battle system, fights are going to be tough, strategic and exciting. Each character possesses his own specifications and attacks coming from the manga/anime. The game also adds special moves called 'Combination Attack' and 'V-Voltage System' – making battles even more aggressive. Arcade Mode An Arcade Mode has been added to the game in the same vein as other fighting games.